Judge Blocks Oversight For NYPD's 'Stop-And-Frisk' Policy : The Two-Way The federal appeals court also removed a judge who ruled on the case in August, saying her media appearances had compromised any appearance of impartiality. 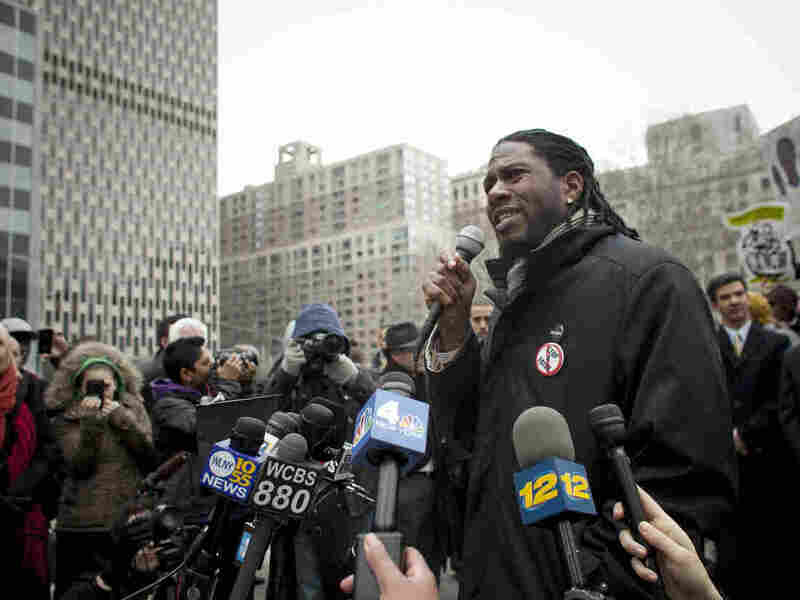 New York City Council member Jumaane Williams speaks at a March demonstration in Lower Manhattan against the city's "stop-and-frisk" searches. A federal appeals court judge has put a temporary hold on changes to the New York Police Department's controversial "stop-and-frisk" policy ordered by a lower court and suspended the judge who made the earlier ruling. The 2nd U.S. Circuit Court of Appeals granted New York's request to stay the changes, which include a monitor to "ensure that the practice is carried out in a manner that protects the rights and liberties of all New Yorkers, while still providing much-needed police protection." Judge Shira Scheindlin said in her August ruling that stop-and-frisk "demonstrated a widespread disregard for the Fourth Amendment." She said the NYPD had violated the rights of tens of thousands of people by profiling black and Hispanic men. But the Court of Appeals panel on Thursday said that Scheindlin "ran afoul" of the judicial code of conduct and damaged any appearance of impartiality by talking to the media in response to criticism of her decision. The panel also criticized Scheindlin for "how she had steered the lawsuit to her courtroom when it was filed in early 2008," The New York Times says. NPR's Joel Rose in New York tells All Things Considered that the stay will remain in effect until the city's appeal can be heard, probably next year. He says that since stop-and-frisk has become such a hot issue in the mayoral race, it's possible that the policy might be on the way out regardless of the court's actions. Shortly after the August ruling, New York's City Council voted independently to approve additional oversight for police, overriding a veto by Mayor Michael Bloomberg. One bill creates an inspector general for the NYPD and another makes it easier to sue for racial profiling.